News and info about the Australian lottery, as well as those big winners down under. Read more about the Australian lottery and syndicates here. There are a lot of unusual and incredible stories this week. To start things off, a man who won a $16.6 million jackpot hung up on lottery officials who tried to contact him – he thought it was strange! $16.6 Million Lotto Winner Hung Up On Lottery Officials! People react differently to lottery wins. In this video you can almost imagine the surprise of lottery officials when the man they called about a $16.6 million prize hung up on them. Distance did not prevent an Aussie grandma from winning a million dollar U.S. lottery prize. 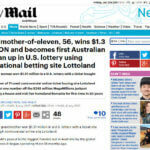 The Melbourne woman used the online site Lottoland (see our review here). This week lots of people from all over won large and even larger amounts they are all happy with. This includes an NZ couple who posted a huge $27 million win on Powerball. Just a few weeks ago, the man had been made redundant from the job he had been holding for more than ten years. The NSW Lottery set up a campaign to identify the winner of a division 1 prize on its January 9 2016 draw. More than a year had elapsed, but the claim period for the NSW must be very long indeed. This week’s best stories of features lottery winners from all over the world. In Israel, a poor couple hoping to win enough to pay an outstanding electric bill won the top prize in the Israeli Lottery. An old Australian couple decided to gamble the last money they had and managed to come up winners in the Lotterywest draw. Before the win the couple had been in dire straits and were already contemplating selling their home if the mortgage payments become unmanageable.